Our Team: Providing Expert Pest Control Service in Carmel and the Surrounding Areas | Ailing House Pest Management, Inc.
With more than a century of collective experience managing pests in Carmel and throughout the Monterey Peninsula, you can count on Ailing House Pest Management, Inc. for all of your pest control needs for your home and your business. 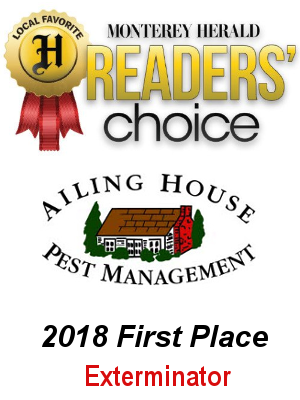 We are very proud of the fact that our dedicated team of pest control service professionals has selected Ailing House Pest Management, Inc. to further their careers. We carefully select our team based on experience and expertise. Many of our trained professionals have been with our company for many years. This level of retention in a high turnover industry speaks volumes about our commitment to our employees and our customers, as well as our dedication to being the leaders in our industry. Using the most advanced technologies and techniques available and hiring only the most qualified, licensed exterminators in the business, Ailing House Pest Management, Inc. has what it takes to manage even your most challenging pest problems – understanding the unique environment of the area, as well as the specific biology and behavior of each pest species. As current owner of Ailing House Pest Management, Inc., Vince is the operations manager and a specialist in general pest and termite control. With years of experience and expertise, Vince truly believes that there is no pest control problem that Vince and his trained team can’t resolve. Charlie is the lead pest management technician with over 15 years of experience. Charlie knows how to get the job done efficiently for each and every customer. Steve has 20+ years of experience and is our “all-around” technician, which includes termite damage repair…his specialty, while providing expert service to his customers. John, is our newest technician who is a friendly, motivated and hard working member of our team who specializes in regular service general pest control and rodent maintenance. Alex is another highly motivated and dedicated construction team member. Alex is friendly to customers, and a very skilled repair and construction team member. If you have noticed pests in your home or business, you may have an infestation. Don’t take chances and call Ailing House Pest Management, Inc. today at 831-624-8211 for a free limited inspection and estimate.